Whether you're just getting started or honing your skills, clinics are a great way to learn more about triathlon, meet training buddies, and get answers to your questions. Most clinics are free, and you can join as many as you'd like! Learn important ride safety and bicycle maintenance checks to perform before you ride! Bring your bike, and come ready to ride! Free. Learn proper swimming technique to ensure efficient and safe swimming. This training clinic focuses on stroke technique (includes stroke, breath and conditioning work) and preparation for Mighty Mujer Triathlon. Swimmers will learn and practice drills to increase efficiency, gain endurance, and correct form. Please arrive ready to swim! Bring goggles and a swim cap. FREE. Limited to 25 swimmers. Sign up HERE. Learn the fundamentals for climbing and descending, and practice getting up those hills! Bring your bike, and come ready to ride. Free. All attendees will be entered to win a FREE Core Body Balancing Massage* valued at $120 (must be present to win). Enjoy mini massages and more with The Woodhouse! Meet one of The Woodhouse Day Spa's seasoned massage therapists, Chris Eck, demonstrate the Core Body Balancing Massage* which will help increase your flexibility and mobility using therapeutic techniques known to take your performance to a higher level. These techniques are also ideal to help assist with chronic situations without the pain. Get instruction and tips on transitions! Practice setting up your transition area and learn about brick workouts. Bring your bike and run gear, ready for a short bike-run brick workout and transition practice. Free. Customize your very own Mighty Mujer t-shirt! Stop by Big Frog Custom T-shirts & More or order online after the event. Learn the most commonly violated USA Triathlon Rules, and be prepared for race day! 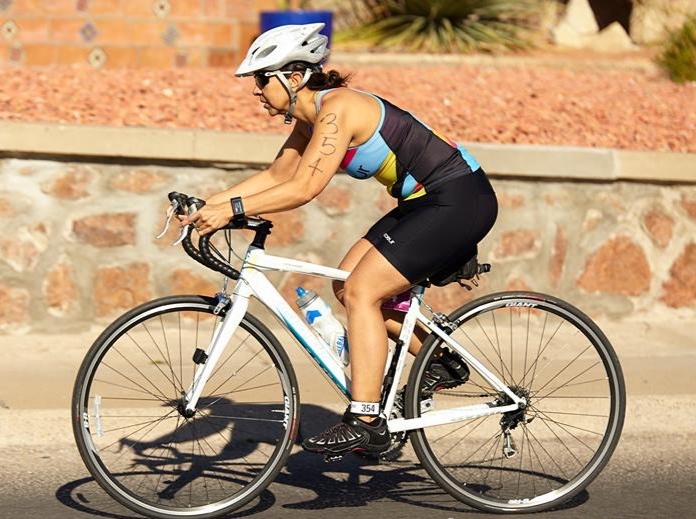 After the rules review and Q&A, ride the Mighty Mujer Triathlon bike course. Bring your bike and come ready to ride. Free. Copyright Race El Paso 2019. All rights reserved.